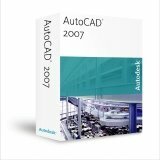 Autodesk today launched the 2007 product folio that include AutoCAD 2007, Autodesk Revit Building 9, Autodesk Architectural Desktop 2007 (ADT) and AutoCAD Viz 2007. AutoCAD 2007 has new set of cut tools for converting solid designs into 2D drawings. The 3D design capabilities of AutoCAD 2007 have been enhanced keeping in mind the visualization needs of Architects. Using the AutoCAD 2007 Walk and Path animation tools, designers can create sophisticated walk-thrus inside AutoCAD without switching to 3DS Max 8. The Mental Ray rendering engine of 3DSMax is now also a part of Autocad 2007. The AutoCAD 2007 DWG file format has been updated and is different from the 2004/2005/2006 DWG file formats. The Autodesk DWG TrueConvert software will translate any AutoCAD or AutoCAD-based drawing file for compatibility with AutoCAD Release 14, AutoCAD 2000, 2000i, 2002, 2004, 2005, 2006 and 2007 versions. The evaluation kit has two free 30-day trial CDs of Autocad 2007 and Revit Building 9 plus a link to other evaluation tools including white papers, an online Revit demo, and an ROI calculator.